Ann. Bot. [König & Sims]. 1: 241 (1804). Barabary Nut iris, Fjurdulis salvagg. Selmun, Malta, 22-03-2017. 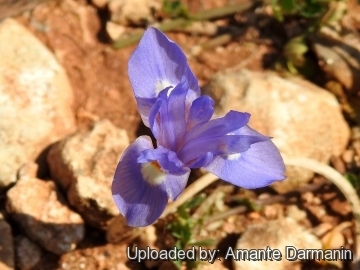 Origin and Habitat: Moraea sisyrinchium is a native of the southern parts of Europe (Portugal, Spain, Balearic islands, Italy, Greece, and Malta), northern of Africa (Libya, Egypt). It also spreads in south-west Asia as far as Packistan and Himalaya. Altitude range: 0-1000 metres above sea level. Habitat and ecology: Common in poor or dry sandy and rocky places in garigue (open scrubland with evergreen shrubs, low trees, aromatic herbs, and bunch of grasses), rocky valleys, rocky steppe, paths and other open ground (also disturbed). It is used occasionally as an ornamental, cultivated plant. 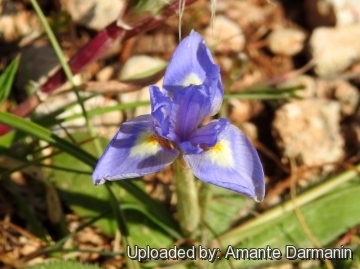 Iris sisyrinchium var. major Cambess. 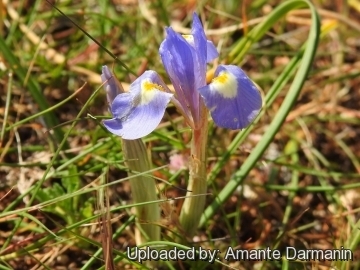 Iris sisyrinchium var. minor Cambess. Iris sisyrinchium subs. fugax K.Richt. Description: Moraea sisyrinchium is a bulbous rooted flower with usually a solitary leaf, (sometimes two) often lying-coiled on the ground. Probably it is one of the oldest irises in existence, retaining the archaic features of the stock from which many other irises have descended, and in this respect it is therefore one of the most interesting of all. It is exceedingly variable. While some forms are not worth growing, some are exceedingly charming. The variations are from light blue to reddish purple, with variable spots and veins on the blade of the 3 recurred outer tepals (the falls). The 3 inner tepals (standards) are erect. Corm: Bulb-like, tuberous, ovoid, 1.5-cm long, 2.0-2.5(-2.5) cm in diameter with lage outer tunics that are fibrous, netted and quite rigid. Leaves: Only 1-2, long, sub-distichous, deeply channelled and grooved, linear 20-40(-50) cm long 2-8 mm wide, green above, paler below, often lying-coiled on the ground. Stem: Weak, (4-)10-30(-40) cm long, usually simple a terminal inflorescence, occasionally with 1-3 branches. Inflorescence: 1-3(-7) cymes, terminal and lateral each with 1-4 flowers. The flowers come out from membranous, silvery-transparent spathes 5-7 cm long. Flowers: Delicate and short lived, short-pedicellate, 2-2.5 cm in diameter, pale greyish-blue to bluish-violet and perianth tube absent, Pedicel about 1 cm long. Outer tepals (perianth segments) (10-)20-40 mm long, 4-15 mm wide, pale or dark bluish, violet or purple (rarely white), spreading-recurved, with a basal white spot and a central yellow signal stripe and speckled or spotted darker. Inner segments (10-)15-28(30) mm long, 20-40(-50) mm wide, erect. The stamens are attached to the branches of the style, the anthers are 4-10 mm long, linear. Ovary pedunculate. Style branches 5-6 mm, petaloid, shortly forked at apex. Fruit: The fruit is a cylindrical-ellipsoid, somewhat trigonous capsule c.2 cm long, 0.5 cm in diameter, with an elongated beak almost concealed by the bracts. Seeds: Many oblong to ovoidal, 1-2 mm long with a short point, brownish to black. Blooming season: Spring (in habitat March to May). The flowers open only for a few hours before withering. 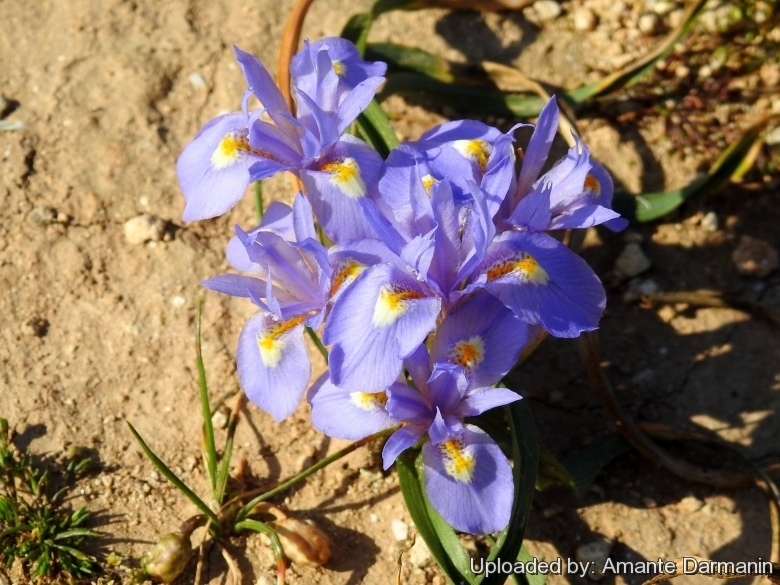 Iris sisyrinchium var. maricoides (Regel) Lynch: Flowers, much spotted ; anthers for the most part free. Moraea sicula Tod. : Flowers, exceedingly small, leaf attaining 90 cm or more in length. 6) Alcaraz Ariza, F. et al. (2002). “Flora básica de la Región de Murcia”. Sociedad Cooperativa de Enseñanza "Severo Ochoa".